Just a short blog this week, as I’m afraid my cold has returned with a vengeance and I’m a little the worse for wear: my chest is so tight I might as well be wearing a corset (or, er, so I would imagine, *cough*), and I have a tendency to slump in my chair like a Stephen Hawking who’s really let himself go. Several times the neighbours have gone out to help jump-start a car which won’t start, only to find it was me coughing. It will pass, but once again God has given me a glimpse of what it’s like to be ninety. My only consolation is, it’s not flu – as a doctor said on the radio when someone asked them how you could tell the difference between a bad cold and the flu: if someone leaves a sack containing a million pounds on your front doorstep, and you’re too sick to get out of bed and collect it – that’s flu. 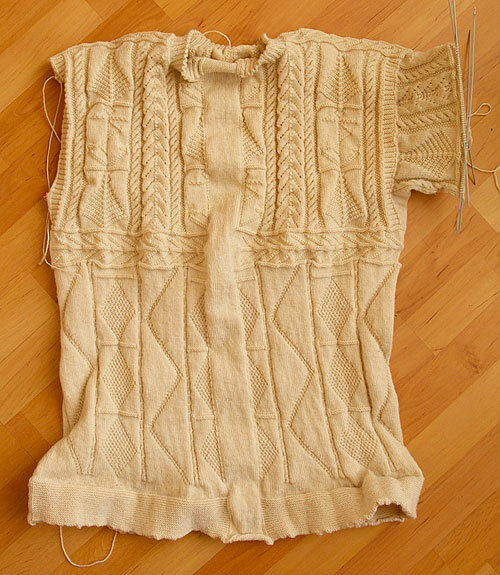 Notwithstanding all this, I’m making steady progress down the sleeve, and have finished the first panel and decreased the gusset out of existence. I’ve just started the herringbone panel, which is something of a relief as I was finding the top pattern a bit challenging in my addled state. 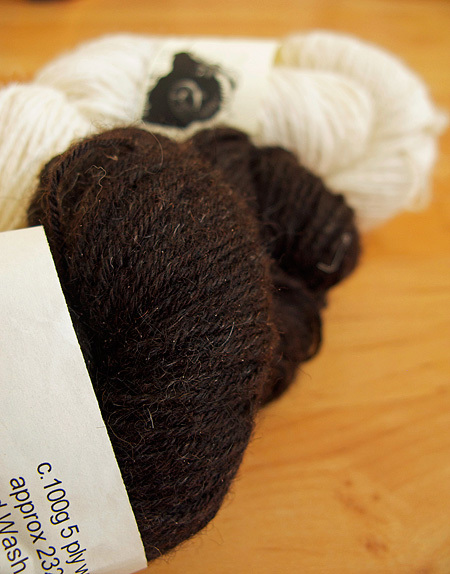 Special thanks to Yasmin at Island at the Edge for sending me a couple of samples of their gansey yarn to try. The more people out there supplying gansey materials the better, I feel, and I’m looking forward to giving this a go, especially the natural yarn. Also thanks again to Judit for making me a phone case like the one we showed last week. Again, a very innovative use for leftover yarn (this one featuring Caithness flags, a nice touch!). The curly strap reminds me of a chameleon’s tail. Right. I’m afraid it’s back to bed for me while the blog pixies (aka ‘tech support’) take over from here. I look forward to rejoining the human race in a few days – see you then. Hello Gordon, I’m sorry you’re not feeling well. I hope in addition to the blog pixies you find some well-being tinkerbells. Did this wool outfit send you enough wool to make an actual gansey or just 2 skeins? Take care of yourself. I recommend as close to total coverage with wind-proof and water-proof materials as possible (I understand the need to see where you’re going). Sending get-better thoughts your way, Gordon. I have begun a swatch for my gansey. I’m trying out a Flamborough pattern. So far, so good. Hope you are better G.
Veronica, it’s not so much ribbing round the sleeve as a ladder marking the border of the yoke. 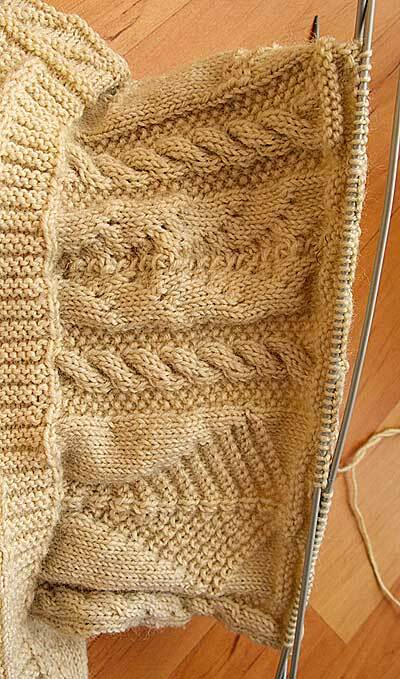 It just happens to be 2 rows of knit and 2 rows of purl! And the bottom of the sleeve will be left blank, probably about halfway down the forearm.